Strong Aussie Jobs Data to Boost AUD/USD? – Took Profit! What a perfect way to start Q4! It might have taken a couple of days, but yesterday AUD/USD finally hit my profit target. 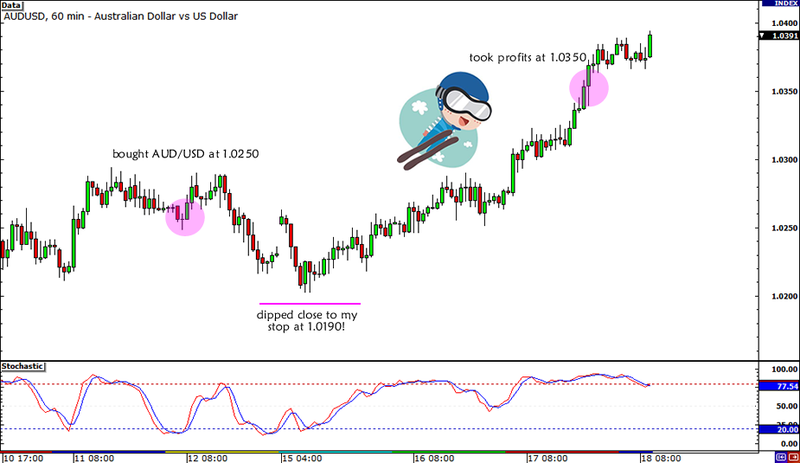 Just after I moved my stop loss to break even, the Aussie bulls flexed their muscles and continued to drive AUD/USD all the way to an intraday high of 1.0389. As it turned out, risk appetite dominated price action yesterday as Moody’s confirmed Spain’s bond ratings, Australia printed a slightly better -than-expected MI leading index, and the U.K. released strong employment numbers. As much as I would’ve liked to get a piece of the extra action though, I’m pretty happy with taking profits at 1.0350. Hey, a 2:1 reward-to-risk trade and close to a 1% gain on my account isn’t half bad, right? Now that I have broken my losing streak, I can only hope to spot another good swing trade setup for this week. Got any ideas? You know where to reach me! 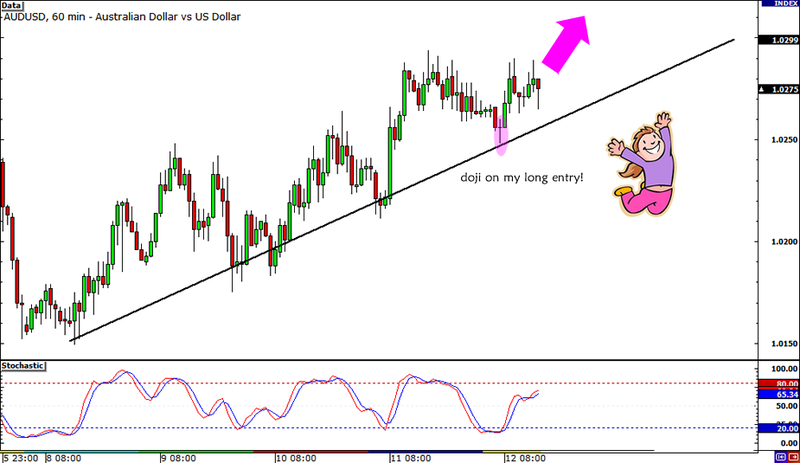 This one sure took a lot of patience, but I was finally able to move my stop to entry for a risk-free AUD/USD trade! As I mentioned in my Facebook page, the pair came a hairline close to my stop below the 1.0200 major psychological handle and had me biting my nails for a while. I decided to hold on though and it seems like it’s paying off for now. All I had to do was to remind myself that I was in a swing trade and that the smaller retracements shouldn’t bother me while the uptrend is still intact. After all, as I pointed out in my Q3 2012 Trading Review, I have to take the recent market environment into consideration in making my trading decisions. As of this writing, AUD/USD is just 40 pips away from my target at 1.0350. If it hits my PT, I’d make a 2-to-1 return on this trade, which would be a 1% gain on my account. I know I really shouldn’t count chickens before they’re hatched but wouldn’t it be pretty sweet to have my first win for Q4 2012? How are your trades going this week? My order got triggered, folks! 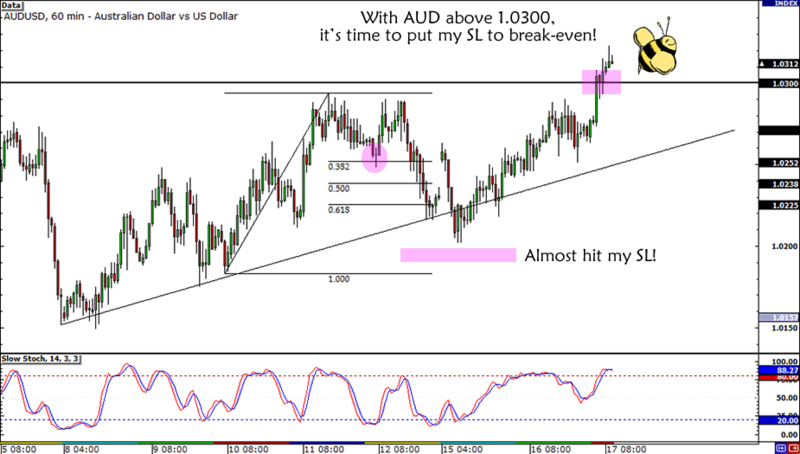 A couple of hours ago AUD/USD slipped to the 1.0250 area, which hit a bulls eye on my entry order. The pair just touched the level though, and even closed the 1-hour candle as a doji before it went back on its way to its previous highs. Right now the pair is still above the rising trend line that we spotted yesterday and is also showing a bullish divergence on the 1-hour chart. Does this mean that we’re about to see more Aussie strength for the rest of the day? I sure hope so! Because my trade journal review for Q3 showed that lady luck isn’t on my side for day trades, I’m thinking of keeping my trade open over the weekend. I’ll move my stop loss to break even though, once the pair breaks above the 1.0300 major psychological handle. Hey, a girl has to protect profits, right? What do you think of my plan? Is it a good idea to keep my position open over the weekend or should I go ahead and take profits now? Your two cents would be much appreciated! See ya on the other side of the weekend! I’m so excited to kick off Q4 2012 with my very first trade for the quarter! Since Australia just reported strong employment figures, I’m thinking of buying AUD/USD today. Just a few hours ago, the Land Down Under printed better than expected employment change data as the figure came in at 14.5K in September, higher than the estimated 5.1K increase. This also marked a decent rebound from the 9.1K drop in hiring seen last August. I also believe that China’s improved HSBC services PMI and the PBoC‘s recent easing efforts could keep AUD/USD afloat for the rest of the week. As for technicals, I’m waiting for a nice pullback to the top WATR area, which is somewhat in line with the rising trend line on the 1-hour time frame. This is also located somewhere around the 38.2% and 50% Fibonacci retracement levels. I plan to go long around the 1.0250 minor psychological support and place my stop below the 1.0200 handle. As for my target, I’ll be aiming for the 1.0350 area, which would translate to roughly 2-to-1 in reward to risk. Don’t forget to read our risk disclosure if you plan to follow my lead! 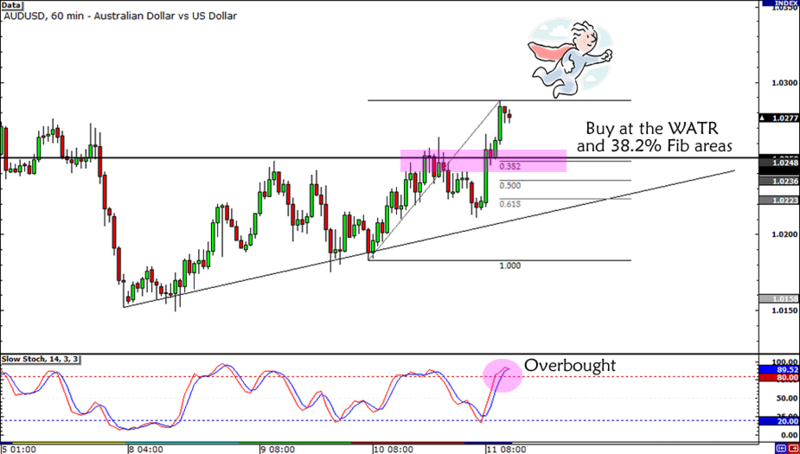 Buy AUD/USD at 1.0250, stop loss at 1.0190, PT at 1.0350. What do you think of this trade idea of mine? Will it enable me to start Q4 2012 with a bang? Don’t be shy to share your thoughts! Happy Pip takes over Google+! Good luck trading this week, friends!